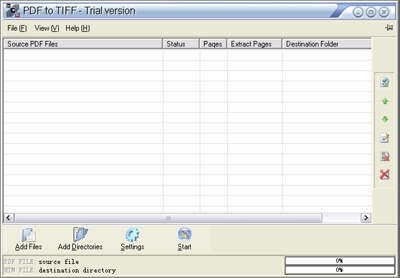 It quickly convert PDF document to tiff format. It supports batch PDF to tiff conversion. It supports conversion of vector graphics into tiff files. It supports any resolution in the generated tiff files. It supports conversion into 1bit, 4bits, 8bits,4bits grayscale ,8tits grayscale and 24bits format image. It supports multifarious compression of tiff image,such as LZW, JPEG,PACKBITS, CCITT Group3,CCITT Group4,RLE etc. It converts drag and drop of files. Qweas is providing links to Ap PDF to TIFF converter 4.1 as a courtesy, and makes no representations regarding Ap PDF to TIFF converter or any other applications or any information related thereto. Any questions, complaints or claims regarding this application Ap PDF to TIFF converter 4.1 must be directed to the appropriate software vendor. You may click the publisher link of Ap PDF to TIFF converter on the top of this page to get more details about the vendor.